The boys’ basketball team won a thriller on Tuesday night against the Frisco Raccoons as Senior, Luke Ledebur, hit a free throw with 5.5 seconds left to put the Leopards ahead for good with a 34-33 win. Both teams knew going into the game that it would be a low scoring contest as both teams are some of the best defensive teams in the state. Lovejoy and Frisco traded baskets in the 3rd but Kolby McSpadden’s dunk sparked a rally late in the quarter. Frisco answered with a big three which was answered by sophomore Carson Holden. Going into the 4th quarter the score was knotted at 24-24 but Lovejoy made timely stops and Ledebur went 3-4 from the free throw line to put the game away. Jonathan Lawrence pulled down 9 rebounds to lead both teams. Lovejoy was lead in scoring by McSpadden with 10 points, Kyle Olson chipped in with 9, while Holden went for 7. 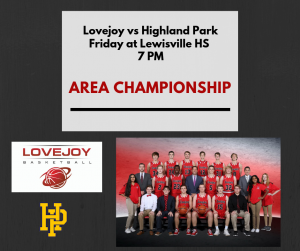 With the win, Lovejoy advances to take on the Highland Park Scots on Friday night at Lewisville High School.